The first thing that caught my eye was a set of four flour-sack tea towels. I had seen these many times on Martha's television program and in the magazine but today, for whatever reason, their simple beauty and utility really struck me. They are very large and extremely sturdy, appearing to be quite absorbent. The set was also very reasonably priced at $8.00 (Can.) for four towels. I'm not sure if I will use them for 'everyday' purposes or not. 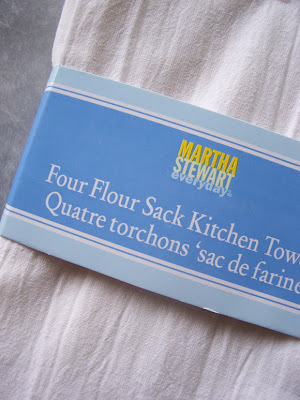 The flour-sack towels are frequently touted in Martha Stewart ads and articles as ideal canvases for projects. 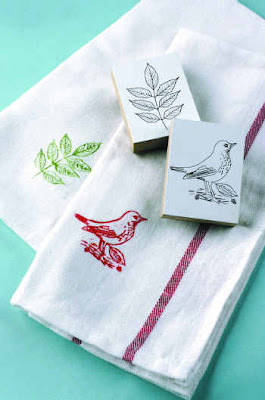 They lend themselves perfectly to stamping (below) and embroidery. Martha has also used them to create picnic pouches and to wrap homemade jams and breads to give as gifts, tucking the contents inside and tying the loose ends with silk ribbon. I may also be moving to a larger space in the next few months, which will mean a larger kitchen. I'll have to foresake my kitchen stools and counter for a proper table. Rather than spend all my cash at IKEA (which I love, but those Scandinavian lines can get bit a rigid) I may spend some of it at Sears on this lovely set of furniture, below. Again, the prices are very reasonable. I also like that the table has small drawers - a vintage touch that was common between 1930 and 1970. The Windsor chairs are darling and comfortable (I tried them out) and I am very drawn to the brightness of the white laquer. I'll keep you posted! Lovely photos, Andrew. I like the one with the industrial windows. The only area in which my tastes differ from Martha's is in the light colors. I prefer deeper and brighter colors than she usually uses. I certainly wish Sears would see her stuff in the US. My local K-Mart is just falling apart. The roof leaks and the shelves which are full have old stuff from 4-5 years ago and the rest are pretty much empty. Sorry about the rant but K-Mart is so easy to get to from home and I hate having to go further.